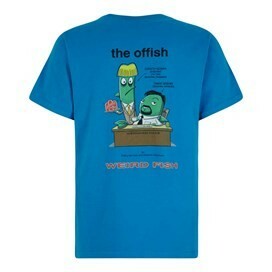 Wear our Offish Artist T-shirt and pay homage to the brilliant David Bream and Gareth Koinan characters. If you're a fan of the cult British comedy why not show your love with the latest addition to our range of Artist T-shirts. This exclusive design for Weird Fish is a limited edition cotton Artist T-Shirt by Tim Harries. It's available in a variety of colours and features the ‘Offish’ print in large on the back with a smaller version on the chest. The pun tshirts are my favourite and an office themed one is perfect. The quality is great.